4 Bedroom Detached House For Sale in Liverpool for Asking Price £425,000. Entwistle Green Prestige are delighted to offer this stunning detached character property, set behind private gates which is ideal for families. The home has been finished to a very high standard and is being sold with no-ongoing chain. 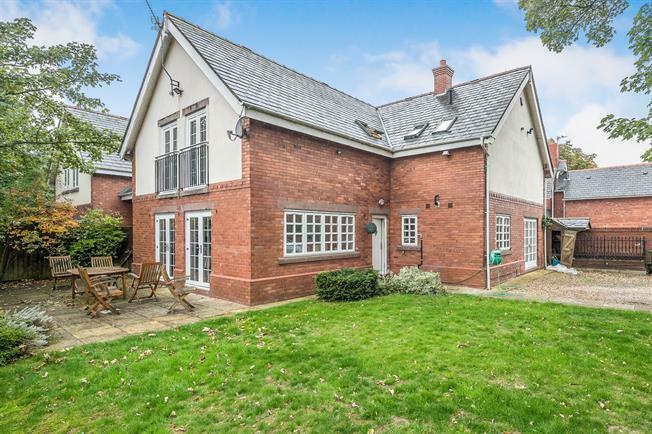 The property briefly comprises of an entrance hall, kitchen/diner, utility room, three reception rooms and a downstairs WC. To the upstairs of the home are four bedrooms, two en-suites and a family bathroom. The outside of the home benefits from stunning views, private parking, a garden and a courtyard. This property is not one to miss and early viewings are strongly recommended to truly appreciate how stunning it really is. Call us today to discuss! UPVC front door, opening onto the driveway. Radiator, amtico flooring, built-in storage cupboard. Stairs leading to the first floor. Double aspect double glazed hardwood windows facing the side. Radiator, amtico flooring. Hardwood French double glazed door. Radiator, amtico flooring. Double glazed hardwood window facing the front. Radiator, amtico flooring. UPVC French and double double glazed door, opening onto the garden. Double glazed hardwood window facing the front overlooking the garden. Radiator, amtico flooring. Granite effect work surface, fitted, bespoke kitchen units, inset sink, integrated double oven, integrated microwave, induction hob, over hob extractor, integrated dishwasher. Double glazed hardwood window facing the side. Radiator, tiled flooring, boiler. Fitted units, space for washing machine and dryer. Radiator, tiled flooring, tiled walls. Built-in WC, wall-mounted sink. UPVC French double glazed doors opening onto a Juliette balcony. Radiator, carpeted flooring. Bespoke fitted wardrobes with a secret door leading onto a hidden en-suite shower room. Double glazed hardwood velux window. Heated towel rail, tiled flooring, tiled walls. Built-in WC, walk-in shower, pedestal sink. Double aspect single glazed hardwood windows facing the rear. Radiator, carpeted flooring, fitted wardrobes. Double glazed hardwood window facing the side. Radiator, carpeted flooring. Bespoke fitted wardrobes with a secret door opening onto a hidden en-suite bathroom. Double glazed hardwood velux window. Heated towel rail, tiled flooring. Built-in WC, panelled bath, single enclosure shower, pedestal sink. Double glazed hardwood window facing the side. Radiator, carpeted flooring. Double glazed hardwood velux window. Radiator, tiled flooring, tiled walls. Built-in WC, panelled bath, walk-in shower, pedestal sink.